When you get food stuck between your teeth, there are many things you can say about it and none of them are good! It might feel uncomfortable, it may begin driving you crazy, you may feel embarrassed by the way it looks if it’s visible, and you’ll certainly worry about your oral health if the food is really stuck and doesn’t seem to want to come out. Fortunately, you don’t have to worry in the least! Our Conroe, TX team can make this something that’s easy to overcome with just a bit of advice. We remind you to use floss the same way you always use floss if you have food or something stuck between teeth. What else would you do with your dental floss, you wonder? Well, what we mean is: Gently slide the floss between your teeth. Begin just beneath your gumline and try to wiggle the food free. If this is difficult or is not working, don’t press too far into your gum tissue. Don’t become extra forceful. Don’t spend a full 20 minutes flossing. What you really don’t want is to cause irritation or to damage your oral health by injuring soft tissue! You know that rinsing and brushing you do to prevent cavities and the need for dental fillings? Try that! By rinsing, you often help soften and dislodge stuck food. Then, by brushing, the bristles can often tug on and dislodge food stuck between teeth. While this is not always a successful method, it is one of the approaches you are welcome to try that might help without accidentally causing harm! 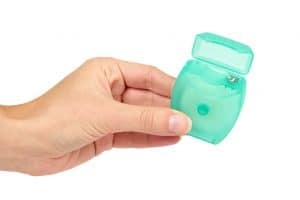 Now, if you flossed, you brushed, and you’re still without luck, you may floss one more time to see if your rinsing and brushing helped soften things up at all. If your final pass with your dental floss is just not proving to be successful, don’t worry: Help is here! Call Us For An Urgent Visit! As mentioned, help is literally right here, in our practice! Bring this minor (but pressing) oral health issue to our practice by calling in for an emergency dental visit. Don’t be embarrassed! These things happen and we would much rather address them on your behalf, so you can enjoy a smile that remains protected. Whether you need help with something as serious as a tooth that’s been dislodged or something like food stuck between two teeth, always remember that if it’s urgent, we are here to help you with an emergency dental visit! Come in for a visit in Conroe, TX by scheduling a visit with the Dental Centre of Conroe by calling (936) 441-4600. We serve patients from Conroe and the neighboring communities.